Sport and racing betting has grown into a huge industry and Australia is one of the biggest exponents of it. Aussies wager more per person than any country in the world with both land-based punting and online betting huge regulated industries in this country. Safe Bookies is a leading information resource for everything to do with gambling on Australian racing and sports. Our staff are made up of mad punters who will keep you up to date with all the latest betting news as and when it happens, with a special focus on current trends in the most popular sports markets. We will also show you where to get the best odds and bonuses on sports betting in Australia, along with essential info like how to place a bet via the Internet, explanations of the different wagers and markets available, and how to create and manage an online betting account. Some of the biggest online bookmakers in the world operate in Australia, including William Hill, Paddy Power (Sportsbet) and Bet 365, while there are also popular local options like Crownbet and Luxbet. For Australians or people living in this country, it means there is plenty of value to be found in odds, sports and bonuses. It is 100 per cent legal to bet on sports on the internet in Australia, with many of the biggest bookmakers operating out of the Northern Territory, one of the most respected jurisdictions in the world. The great thing about Internet betting is it takes only a minute or two to get the ball rolling. Just head to one of our trusted gambling websites listed above and look for the ‘Join Now’ or ‘Sign Up’ button near the top of the page. Click that, fill in the registration form (name, date of birth, etc.) and submit – and now have an online betting account. From there, it’s just a matter of adding some funds and finding your favourite sporting events to bet on. www.Crownbet.com.au – Crownbet is our top-ranked online bookmaker. Not only does it offer competitive odds across a huge range of betting markets, dedicated mobile apps for iOS and Android devices, and a desktop layout so slick and simple you could use it in your sleep, it is also 100% Australian owned and operated. www.WilliamHill.com.au – William Hill remains one of the most respected names on the Australian gambling scene. The company has vastly improved its online and mobile gambling interfaces in recent years, making it easier than ever to access the thousands of international and domestic betting options on offer every day. www.SportsBet.com.au – If you haven’t heard of SportsBet Australia, you must have spent the last couple of decades under a rock inside a cave atop a mountain in outer space. Owned by Irish bookmaker Paddy Power since 2010, SportsBet.com.au specialises in mobile gambling applications for iPhone, iPad and Android devices. www.Bet365.com.au – The Bet 365 desktop site and mobile apps offer a slightly different look and feel to our other top-ranked gambling platforms, but it sacrifices nothing in terms of the quality and scope of its sports and race betting markets. Dedicated form guides and stats sections make this a great place to do your research for horse racing, greyhounds, soccer, US sports, rugby and much more. SafeBookies.com prides itself on only recommending bookmakers with great reputations, strict security measures, strong market options and of course they must be mobile friendly. Sports betting in Australia is a huge market, and very popular. Some of the most popular sports to wager on is horse racing. The market is huge, and only growing faster. The Melbourne Spring Carnival is famous worldwide for its 3200m feature which has created champions like Kingston Rule and Makybe Diva. All the most popular local sports are covered, on top of a large selection of international sport – which has continued to grow as a focus of Aussie punters. AFL, basketball, golf, tennis, Rugby League and soccer are only a few more of the many sports covered. Some of the major one-off sporting events each year in Australia include the AFL grand final, the NRL grand final, the Australian Open and many major horse races like the Cox Plate, the Australian Cup, the Caulfield Cup and many other group 1s held around the country. As well as the gallops, harness racing and greyhound racing are extremely popular betting codes for Aussie punters. Mobile gambling is the quickest, most convenient way to have a punt on Australian sports and racing events. If you have a desktop betting account with any of our trusted Aussie sportsbooks, you can download one of their purpose-built mobile apps and use your existing login details. You can also create new accounts and make deposits and withdrawals via these mobile bookmaker apps, which are optimised for Apple iOS (iPhone, iPad, iPod Touch) and Google Android devices (Samsung Galaxy, Sony Xperia, HTC One and more). Punting from your mobile handset is possible in Australia with all of the big corporate bookmakers boasting both mobile websites and fully fledged apps, available legally from the App Store and Google Play. The beauty of punting from your mobile phone is that you can do it from anywhere. As a rule, the mobile apps from bookies like Crownbet and William Hill are first-rate. They are easy on the eye, easy to navigate around and most importantly have all of the sports and racing markets that you could possibly want. We’ve all had the issue of rushing down to the TAB to put our bet on and missing the start, but the mobile apps are now to a point where they are a great alternative. Some of the bookmakers (Sportsbet) have televised racing through their mobile applications, which means you can watch races from around Victoria on your device. The advancement in WiFi and Mobile technology (4G) means you can pretty much watch this on any modern smartphone. Top-rated Australian bookmakers like Sportingbet, SportsBet and Bet365 support a wide array of secure online banking options, so you can get money in and out of your account with maximum safety and minimum fuss. Popular instant deposit options include credit cards and debit cards (Visa, MasterCard), e-wallets (Skrill, Neteller, PayPal), prepaid cash cards and money vouchers (Ukash, PaySafeCard), and direct banking solutions (POLi), most of which incur no additional transaction fees. Most sites also offer electronic funds transfers (EFT) and cheques for withdrawals, along with telegraphic transfers for international banking. Depositing money at Aussie bookmakers is incredibly simple. You can do it with your Visa, your MasterCard, Neteller, Skrill and other payment systems like POLi. Keep in mind there is generally a deposit limit, although you can usually circumvent these by doing multiple deposits or doing an option like a bank transfer – which usually does not have a cap on it. Depending on your payment method it may takes me time for your funds to appear in your account, although Visa, MasterCard and the use of web wallets makes your transactions far quicker. The banking options are generally scaled back slightly for mobile but you will the most popular methods still available. Both deposits and withdrawals are protected by a minimum of 128-bit SSL encryption which is in-line with the big banks around the world. Is it legal to bet on sports online in Australia? There are restrictions on casinos offering interactive gaming services to Australian residents restricting providers from offering services no matter if they are located in Australia or abroad. However, unlike the US, it is not illegal for Australian citizens to play online poker or enjoy casino games. It is also legal for Australian citizens to enjoy sportsbetting online. There are many licensed bookmakers in Australia who are forced to operate in a strictly regulated market. This means the bettors are protected against the threat of placing their bets with a corrupt bookmaker. Many of the biggest bookies in this country operate with a Northern Territory Gambling Commission licence with Crownbet, William Hill and Sportsbet all having this type of licence. The only restriction placed on Australians, is the banning of “in-play” betting which means they have to phone up to place a bet on a game that has already started. This came about after a steady flow of complaints of cross promoting gambling with televised sports coverage and the belief it encourages problem gambling. Each one of our recommended sports bookies runs a special sign-up bonus for new customers in the Australian Capital Territory, the Northern Territory, Queensland and Tasmania. These lucrative deals generally come in the form of free bets, where the site will meet your first deposit or wager with a 100% match bonus. What better way to start your Internet gambling adventure than with one on the house? – Sign up at Crownbet and get bonus bets up to AUD $500. 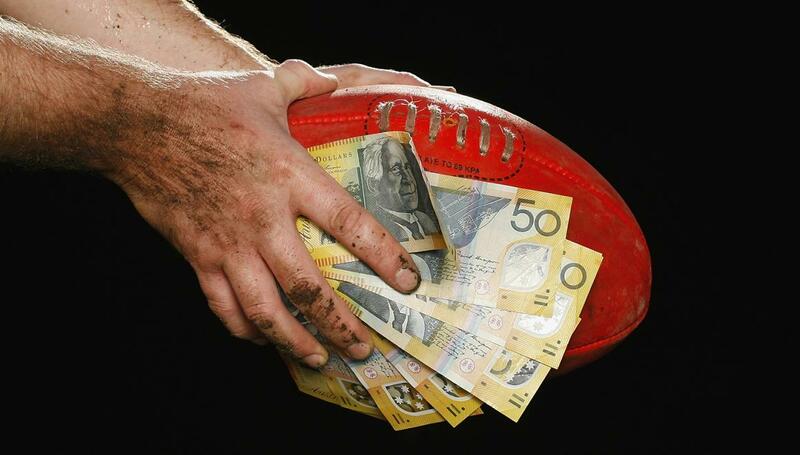 – New customers at SportsBet can score a first bet bonus up to AUD $250. NB: Due to state gaming legislation, these welcome bonuses are not available to residents of New South Wales, Victoria, South Australia and Western Australia. – In a straight bet, you pick one team or player to beat the other. This is simple as it gets. With racing bets, there is also the option to bet on the place (top three finishers) or each way (win and place). – Exotics and prop bets cover those more specific and obscure markets which don’t necessarily rely on your team/player winning the contest. These can include anything from half-time scores and winning margins to more out-there markets like the number of total corners in a soccer match. – Futures/outrights are big-picture wagers which can be taken months in advance of major sporting events like the Ashes and the World Cup. Instead of picking the result of a single match, with futures bets you try to select the eventual winner of the competition – or the top tournament goalscorer, or the player who will take the most wickets, or whether or not a certain team will reach the semi-finals, etc etc. – A multi bet is when you put two or more sports wagers on the same ticket. You can choose whatever betting markets you like, or else go for preset doubles, trebles and other accumulators. The more legs on your multi, the better the payout odds will be, but you must win every single bet in order to claim the spoils – so even on a multibet with 13 legs, for instance, 12 winners will not suffice. Major Sports Markets at Online Bookmakers Australian football – Aussie rules (AFL), rugby league (NRL), A-League soccer and Super Rugby. US sports – Baseball (MLB), basketball (NBA), American football (NFL), ice hockey (NHL), motor racing (Nascar) and NCAA college sports. Soccer – FIFA World Cup, UEFA Champions League, English Premier League (EPL), Spanish Primera Division (La Liga), Italian Serie A, German Bundesliga, Brazilian Campeonato, Major League Soccer (MLS), J-League, K-League and much more. Cricket – Test Championship, T20 Big Bash League, Ryobi One-Day Cup, Indian Premier League (IPL), and the ICC Cricket World Cup and World Twenty20 tournaments. Golf – The Masters, British Open, US Open, USPGA Championship, Ryder Cup, Presidents Cup and the Solheim Cup. Tennis – Australian Open, Wimbledon, French Open, US Open, Davis Cup, Fed Cup and the Hopman Cup. Each of the bookmakers we recommend at SafeBookies.com have strong customer service departments who are more than willing to help when you have a problem. Some of the more common ways to contact customer service at Aussie bookmakers include via phone, live chat and email. This is something you should always assess before signing up at a bookie. If they don’t have easily accessible customer service steer clear. It’s a sign that the bookmaker may not take it’s duty of care to its customer seriously.